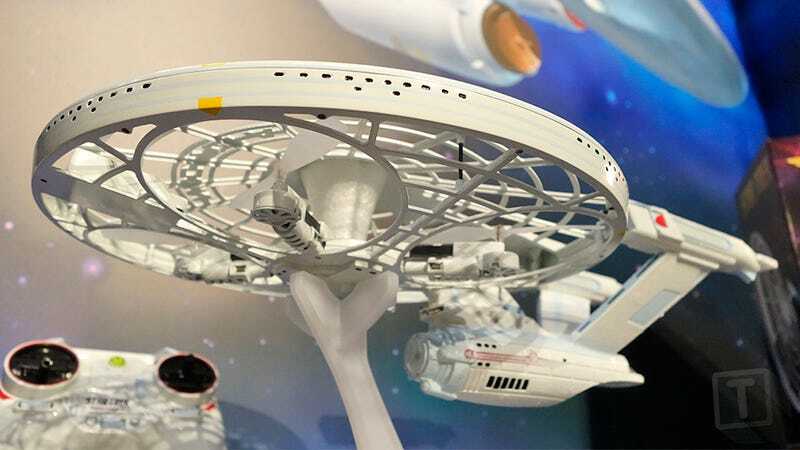 The detailed replica features the entire Enterprise, from its saucer to its nacelles, complete with working lighting and ten authentic sound effects. The four spinning rotors that allow the toy drone to fly are housed inside the ship’s saucer section which is almost completely see-through in this version to allow air to pass through. But otherwise it’s a remarkably faithful recreation of Kirk’s ship. Available later this year for about $120, the USS Enterprise NCC-1701-A drone also comes with a branded controller, so you don’t have to fumble with awkward touchscreen controls on your phone. And while it might not zoom across your living room at close to the speed of light, a trigger on the controller does activate a warp speed mode, complete with the expected sound effects.